At the moment the Parliament has 751 seats, which is the maximum number allowed by the EU treaties. The next election will be between 23 to 26 May 2019. Watch this space for more information. Sign up if you want to receive relevant information about the European Elections 2019 and how to get involved. If you want to find out more, visit the European elections section of the European Parliament's main website. The Electoral Commission has published guidance for the European Parliamentary elections scheduled to take place on 23 May 2019. 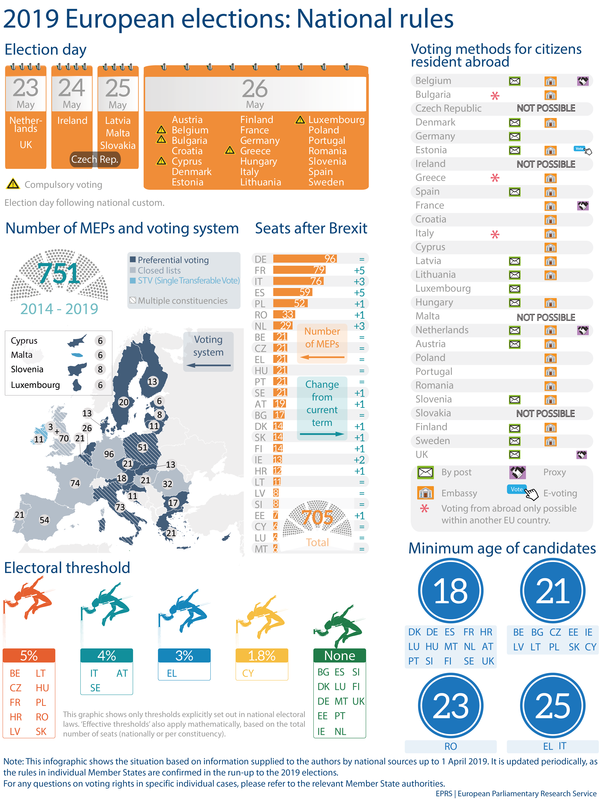 The elections will take place in other EU Member States between Thursday 23 and Sunday 26 May 2019. Citizens from across the EU living in the UK have a choice: you can vote in the European Elections in the UK or in your country of origin. But you cannot vote in European Parliament elections in more than one country.